Neu-F Fiat Abarth Engine Mount Insert. 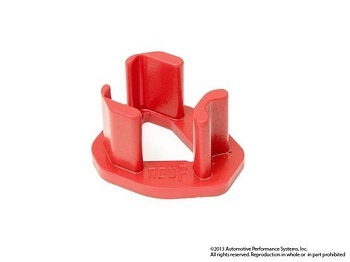 This simple NeuF polyurethane torque arm bushing simply presses into the stock Fiat engine mount. This bushing insert fills in the gaps in the stock rubber mount to stiffen it up and help you get the power to the ground by having less driveline slop. WMW has found this to be a super simple and really cost effective mod that you will actually notice and feel when driving. Sold as one Neu-F bushing insert. Enough for one Fiat Abarth. THIS IS FOR PREORDER, will be available in approx 1-2 weeks and will ship as soon as they are finished.